Ocean Experience instructors are all ocean safety certified and we emphasize learning to surf in a fun and safe environment. Learn more below. Increase Your Ocean Experience with the most comprehensive surf lessons in San Diego available for people that want to learn to surf ages 6 to 60+ in Mission Beach, San Diego. Our 3-hour surf lessons use our proven, 5 - step skill progression method of instruction to help you learn to surf with confidence. Lessons are offered daily in the summer at 10am and 2pm and by appointment in non-summer months. Taught in our easy - to - learn format by certified instructors, you are sure to master the fundamentals of surfing. Ocean Experience offers surfing lessons for advanced, intermediate and beginner students of all ages in private, couples, semi-private or group settings; all of our lessons are designed to take your surfing to the next level. With our authentic San Diego style, we will have you up on a board and smiling in no time. Ocean Experience Surf School develops skills and confidence while instilling a passion to surf for life. Hundreds of our students have gone on to be competitive surfers with many becoming professionals. All students receive complimentary equipment rentals for the remainder of the day after their lesson and exclusive discounts on future rentals and purchases. To see lesson packages and pricing click here. Our open group surf lessons run daily during the summer at 9am and 1pm and we also offer these group lessons throughout the rest of the year by appointment. Anyone can join the open group lesson, just call ahead and let us know you would like to join the group. In the open group lesson, you will join other individuals for a group lesson. Group sizes do not exceed 5 people. If you have a group of 3 or more, you can schedule a private group lesson at a discount rate. Please contact Ocean Experience for more details about a group lesson or make a reservation below. Our open group lessons offer a comprehensive introduction to surfing and are a great way to meet other surfers; students will be placed in a group with others who have signed up for the same date and time. To join an open group lesson, please call ahead or register below to reserve a spot, as groups are limited to 5 people. Cost is $35 per hour, per person. All programs are customized to fit the needs of each group, organization or individual. Guests choose from a variety of optional lessons, classes, activities, and events. More importantly, our staff has been extensively trained and will provide a unique and meaningful learning experience in an exciting and dynamic atmosphere. Schedule your lesson today by calling (619) 225-2317 or select a date on the calendar below and use our online schedule system. Ocean Experience also offers private surf instruction that allows students to work with an instructor one-on-one. Each lesson is tailored to the specific needs of the student and is a great way for those interested in competitive surfing to improve over time. From beginner to intermediate, our private instruction is designed to help each and every student learn to surf and refine their surfing skills. Cost is $50 per hour, per person. All private lessons have a 3-hour minimum. Surfing is not just for the kids, its a sport the entire family will enjoy. 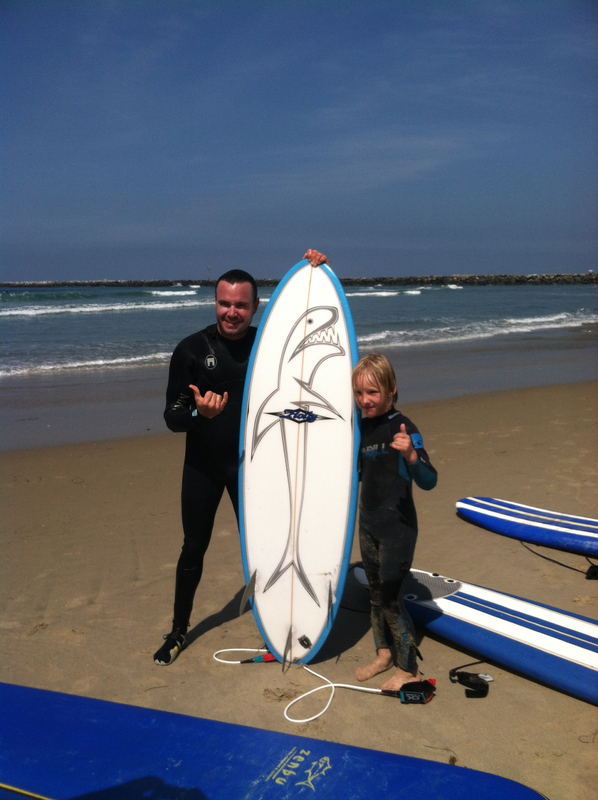 Its never to late to learn to surf for life which is why Ocean Experience also offers an Adult Surf Clinics every day. No matter what the occasion, from birthday to retirement, we can customize an event to fit your needs. Tell us your interests: surfing, kayaking, body boarding, or snorkeling and we will customize the perfect party for your group. We can incorporate a lesson for your guests or simply provide all of the equipment; whatever the case, our professional certified staff does the work so you don't have to. We also offer school parties and demos. Please contact Ocean Experience to plan your next event. Call (619) 225-0674.